Adobe® Premiere® Elements 11 software helps you edit video using smart, automated options, enhance your movies with pro-quality effects, and then share on virtually any screen. Live in the moment knowing that you can easily turn your everyday videos into memorable home movies. 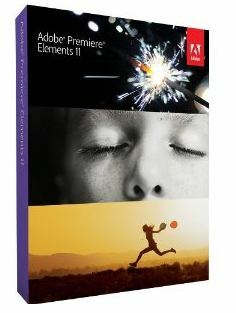 Adobe Premiere Elements is a video editing software application for non-linear video editing, published by Adobe Systems. The software helps you edit video using smart, automated options, enhance your movies with pro-quality effects, and then share on virtually any screen. Adobe Premiere Elements can handle unlimited video and audio tracks, with multiple keyframed effects applied to each clip, as well as Picture-in-picture and chromakey capabilities. It also supports many third-party plug-ins for additional features, including Premiere Pro plug-ins, After Effects plug-ins, and VST effects. It can create bars and tone and a countdown leader, just like Premiere Pro. This program also features real-time video rendering, unlike some other video editing programs, which allows the user to instantly preview edits made to the timeline. Live in the moment knowing that you can easily turn your everyday videos into memorable home movies. Edit and view your movie in one convenient place — the large Monitor window — where you can easily trim and split clips, drop effects right on a frame, create fun picture-in-picture effects, type titles and text right on the screen, and more. Use FilmLooks to apply favorite cinematic styles to your movies. Easily combine elements from different scenes for entertaining results. And add hundreds of amazing special effects and transitions, including new options. Use SmartSound to add a variety of musical soundtracks that automatically adjust to perfectly match the length of your movie. Even sync up your scenes to the beat of your soundtrack. Make all your memories shine whether they’re captured on video or in photos. For example, enhance color in video clips as easily as you do in photos, and quickly bring photos to cinematic life using customized pan and zoom motions. Follow easy steps to create your movie once and then share it many ways. 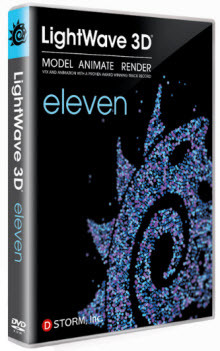 Share on high-quality HD or Blu-ray Disc — and even get HD quality on standard DVDs. Enjoy your movie on virtually any screen, from your iPod to your HD flat screen TV. * Go Hollywood with popular movie styles: Use new FilmLooks to apply favorite cinematic styles to your movies. * Discover a friendly and intuitive environment: Organize, edit, enhance, and share more quickly and easily thanks to big, bold icons; a helpful Action bar; and the ability to choose from Quick and Expert editing modes to fit your needs. * Manage your videos more easily: Intuitively sort and manage videos and photos based on people, places, and events using new Organizer views. * Slow down or speed up the action: Create emphasis, suspense, or drama in key movie moments by adding slow-motion effects. Add fast-motion effects to accelerate your narrative or create a sense of energy, excitement, or fun. * Adjust color with greater ease: Use sliders to adjust the color in your footage as easily as you would adjust the color in your photos. * Share videos and slide shows on Vimeo: Quickly share your video clips and slide shows on the popular Vimeo site. * Map your memories: Relive your journeys by viewing your videos and photos on a map based on where they were taken. * Enhance your footage with powerful photo-blending techniques: Use blend modes to enhance one clip with the colors or textures of another clip, add your signature or a copyright line as a watermark, and more. * Get fresh looks with new effects and enhancements: Impress friends and family by creating movies that feature eye-catching new effects, themes, and more. NBMonitor tracks your Internet bandwidth (upload and downloads) usage, monitors all your Internet, it shows all the active connections you have to the Internet at any given moment and also the volume of traffic flowing through them. NBMonitor displays real-time details about your network connections and network adapter’s bandwidth usage. Unlike others, it shows process names initiated network connections and allows you to set filters to capture only the traffic you are interested in. As a number of ISP’s are now disconnecting customers for using “too much” bandwidth, knowing exactly how much you’ve downloaded or uploaded in a given month can be very helpful. – Professional interface with high-contrast graphics. – Custom loop library includes over 6000 royalty-free loops and sound effects in a huge variety of styles. – Easily import your own loop files and loop CDs into the loop library. – Loop Library features easy search tool to quickly find loops and sound effects. – Works with Acid™ WAV and Apple Garage Band™ AIFF loops. – Record multiple MIDI and audio tracks simultaneously. – Piano roll to view and edit MIDI. 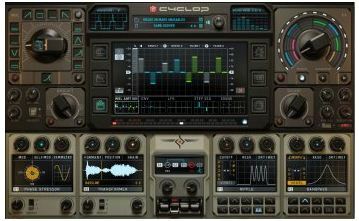 – Drum maps included for Mixcraft’s drum instruments, plus many popular drum applications. – Notation tools allow you to create, edit, and print your MIDI data in familiar music notation format. – 11 powerful virtual instruments, including the Acoustica Instruments General MIDI sample library, Expanded Instruments sample library, Studio Drums sample collection, Lounge Lizard Session vintage electric piano, VB3 tonewheel organ, ComboV and ComboF classic transistor organ emulators, MiniMogueVA monophonic analog synthesizer, Messiah polyphonic analog synthesizer, Alien303 Bass Synthesizer, and Impulse polyphonic analog synthesizer. – 25 high quality effects, including the Pultronic Tube EQ, which models the classic tube equalizer found in studios throughout the world, and theShred Amp Simulator, a complete suite of 5 classic amp heads, 17 cabinet models, and 6 powerful effects. – Built-in guitar tuner available on every audio track. – Save and load complete audio effect chains, with many excellent effect chain presets included. – Create complex virtual instrument setups that layer and split multiple virtual synthesizers and effects. Set the key range, velocity sensitivity, transposition, pan and volume for each instrument. – Add unlimited VSTi™ instruments, VST™ and DirectX™ effects. – Route MIDI track data to audio effects (such as vocoder and pitch correction effects). – Video Track allows loading and editing of video files. Easily cross−fade from one video clip to another. Remix the audio, add a soundtrack, and effortlessly render your video project to a new video file. Powerful video features include still image importing, automatable effects and transitions, and moving text. 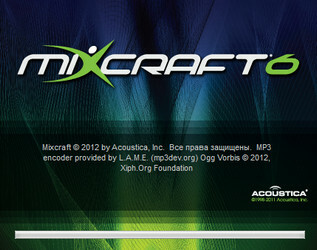 – Mix down to MP3, WAV, high-quality compressed OGG, and other audio file types. – Option to record directly to high-quality compressed OGG files. This is ideal for collaborators exchanging projects over the internet, laptop users, schools, and anyone recording long speeches or conferences. – Insert Time and Remove Time features moves all sounds, automation, and markers so you can add or remove an entire section from your song. – Burn CDs of your mix with just one click. – Wave (WDM), ASIO™, WaveRT, and WaveRT Exclusive Mode low latency audio support. – WaveRT Exclusive Mode (available with Windows 7 and up) provides ultra-low-latency, solid audio performance on most audio hardware without any special sound card drivers. With WaveRT Exclusive Mode, Mixcraft can interface directly with the audio hardware, bypassing the operating system for low-latency audio performance without any special drivers. – MIDI input and output support. Will work with any USB MIDI keyboard or any instrument connected to a MIDI interface. – MIDI control surface support for transport controls, effect controls, and instrument controls. – Time stretch any sound from 25% to 400% with FlexAudio™ without affecting the pitch. – Punch In/Punch Out recording. – Loop recording with multiple takes. – Pitch shift sounds from -24 to +12 semitones!. – Use an unlimited number of tracks, instruments, and effects. – Automatically detects beat locations, keys and tempos of imported songs. – Import WAV, AIF, OGG, WMA, and MP3 files! – Reduce the noise level or eliminate it entirely with built-in Noise Reduction available on every audio clip. – Support for up to 16 processor cores takes full advantage of today’s cutting-edge multi-processor computers. – Shape each sound’s volume, pan and resonant filters with unlimited envelope points. – Support for DirectX™ & VST™ effects, including plug-in delay compensation. – Support for VST instruments with multiple outputs. – ReWire Hosting allows you to sync other music applications with Mixcraft. TurboCAD® Pro Platinum is our most comprehensive CAD product for 2D and 3D design, documentation, detailing, and modeling. In TurboCAD Pro you will find many of the most advanced technologies in the industry: 3D ACIS® Modeler from Spatial, Siemens PLM Software division’s D-Cubed 2D DCM constraint manager, the Redsdk drawing engine for GPU-accelerated 2D and Wireframe display modes from Redway3d®, and LightWorks photorealistic and non-photorealistic artistic rendering capabilities from Lightwork Design. The Platinum product includes all of the advanced features necessary for both architectural design and more specific mechanical design tasks. 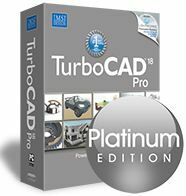 In prior years the TurboCAD product series included specific Mechanical and Architectural Editions. 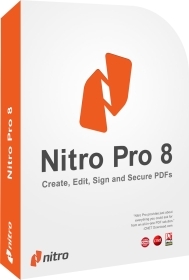 Nitro Pro 8 gives you everything you need to create, convert, edit, sign, and share 100% industry-standard PDF files. It’s simple, straightforward, and intuitive to use – so you can work more productively, your way. With Nitro Pro you can share your files with others, no matter what platform or device they’re on, and Nitro Pro makes conversion easy. Convert one or more files to PDF with just a click or two. Reuse and repurpose PDF-based content with greater accuracy. With Nitro Pro’s industry-leading conversion technology and array of extraction tools you can easily repurpose text and images from reports, presentations, and more for reuse in any other application. Share files with the peace of mind, knowing almost anyone on almost any machine can open, view, and review – every time. Directly edit your PDF files more easily. Just click, and edit. Nitro Pro enables you to edit entire paragraphs with ease, automatically reflowing text as you type – like you would in a word processor. Folder Lock is fast file-security software that can password-protect, lock, hide, and encrypt any number of files, folders, drives, pictures, and documents in seconds. Locked files are undeletable, unrenamable, unmovable, hidden, and inaccessible. You can lock, scramble, or encrypt depending on speed and security. Folder Lock is fully portable, so you can protect your files on USB flash drives, disks, CD-RWs, notebooks, and hard disks, and it doesn’t require installation on another PC. Folder Lock protects files in Windows, DOS, and Safe modes, even when you change your OS or boot from a disk. Folder Lock doesn’t let you delete its own program folder, and it can’t be uninstalled without the correct password. Additional options include Stealth Mode, Hacker Attempt Monitoring, Shred files, AutoLock, Auto Shutdown PC, Lock your PC, Erase PC tracks, 256-bit Blowfish Encryption and Context Menu in Explorer. • Users have an option whether to Encrypt or Lock, choices useful for both power users and casual users. Those who want ultimate security, can choose encrypiton. those who want ultimate speed, can choose locking. 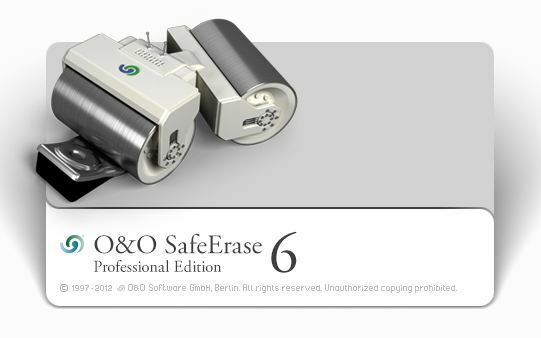 • There’s no longer the hassle of encrypting each and every file on different locations. Think how much time you will save simply by putting all your files and folders in one location. Convenient encryption and decryption happens on-the-fly. • Both Encryption and Locking are exceptionally fast. No competitor is offering this speed while offering 100% secure 256-bit AES Encryption. • The Lockers can’t be deleted on the computer where Folder Lock is installed and Folder Lock can\t be uninstalled without the correct password. • Users who want to password protect folders on multiple locations on their hard disk, not just on the C: drive, can easily protect their files on another partition by copying the \Lockers\ from one place to another or by simply using the \Lock\ feature. • Secure and very strong Encryption. A strong industry standard 256-bit AES Encryption is used to encrypt your files for maximum protection. It is one of the most trusted encryption algorithms used in United States Military. • Folder Lock offers fully portability and it can even protect CD/DVD-RW, not just USB Flash Drive, Memory Stick and floppy disks. To protect data on these drives, you can simply copy or burn your Locker to that drive. • Lockers can also be emailed to someone over the internet. They won\t be able to see your encrypted files without your password / permission. Even if someone breaks through and checks your email attachment in between, he won\t be able to decrypt or use this information without the correct password. • Folder Lock works flawlessly on all Next Technology Windows, i.e. Windows Vista / 2003 / XP / 2000 / NT. It is also fully compatible on all disk drives types including FAT16, FAT32, NTFS and EFS. • You can increase the size of your Locker by simply adding more files and folders into your Locker. Even if you are left with little space in your Locker, you can always increase its size. • Brute force cracking is not possible, since the program delays for some time once a password is entered. This will prevent hackers who may try many different combinations of passwords to get through your files. The program also produces a load beep when an incorrect password is entered, to alert the administrator of possible hack attempt. • Password Strength meter shows you the strength of the password as you type, while you\re setting a new password. Basic rule of thumb is to use a password that is easy to remember but hard one to guess. • Folder Lock doesn\t save the password in the registry or the disk, preventing hackers and crackers. • Folder Lock also offers Auto Protect and Auto Shutdown features, this setting automatically locks or shutdown if more than five incorrect passwords are entered to try to decrypt the files. • Folder Lock erases tracks of users when they click the lock button. It deletes recent document history, find file and folder history and the data in clipboard when you close the Locker. • Protects important files from viruses, hackers, crackers, trojans, malware, spyware, worms, malicious programs and scripts. Protects files from network computers if you do not want to share files on network. Also protects files from hacker tools when you connect to the internet. • While using the Lock feature, users can choose to lock and hide their files simultaneously. Locked and Hidden files are unrenameble, undeletable, unmovable and totally inaccessible. There is no limit to the size of data or the type of files you can protect. • With its reduced file size and compact design, Folder Lock takes only 3.5 MB of hard disk space – small, portable and easy to keep. Thanks to the latest compression techniques. The GUI and interface is so well designed, it looks like an integral part of Windows XP. • Folder Lock isn\t required to run at all times. Moreover, it doesn\t save anything to the registry/run so that users do not have any memory problems or stability problems with the program.